Situated at the far reaches of the Bay Area, Pittsburg has long been perceived as a commuter town, an out-of-the-way bedroom community. Yet this city has a rich and varied history stretching back to the early days of statehood and has played an important role in commerce, both to the state and to the Bay Area. Before long the burgeoning city had a fishing industry rivaling that of San Francisco's famed Fisherman's Wharf and a largely Italian fishing community. By the 1900s, a surprising number of industries set up factories along the waterfront property of Pittsburg. In 1942, the beginning of World War II brought the building of Camp Stoneman, an important departure point for many servicemen. Later, the city became known as a residential destination. Readers of this book will surely see Pittsburg in a new light as they enjoy the surprising and varied tales of the city's previous generations. 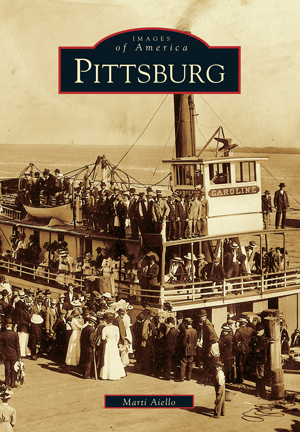 Marti Aiello, director/curator and past president of the Pittsburg Historical Society, has put together this striking volume of images that traces Pittsburg's story from the days when the town was an important shipping port for materials going to supply the Gold Rush.